Bentley looking for Social Media Intern! Are you Facebook fierce? Instantly comfortable doing an Instagram campaign? Have you Tweeted, Tumbled, Plused, Pinned, and Phe(e)d? Do you check Mashable before the weather forecast? Already consider yourself a social media maven, ninja, guru–or at least an influencer with real Klout? Are you a soon to be gradute looking to break into sales? Are you graduating this Spring? Use this post from @Liberty Mutual Responsible Scholars to stay motivated after graduation! Victoria’s Secret/Pink – Retail Opportunities Available! Liberty Mutual – The Right Fit Launch Party! Aspen Technology Seeking May 2013 Graduates!!! STOP BY OUR INFO TABLE AND LEARN ABOUT FULL TIME POSITIONS WE ARE SEEKING TO FILL WITH MAY 2013 GRADUATES! REMINDER: Social Media & LinkedIn Workshop with Fidelity on MONDAY! Bentley Undergraduate Career Services and Delta Sigma Pi proudly present a Social Media & LinkedIn Workshop featuring Fidelity Investments Director of Recruitment, Kelle Thompson on April 22nd. Students are also invited to have their LinkedIn profiles reviewed by Fidelity representatives. To attend the Workshop and/or sign up for a Profile Review, RSVP on BentleyLink (“Social Media Workshop with Fidelity” and “Social Media Workshop with Fidelity (PROFILE REVIEW”). Ask Alyssa Episode 17: Where are you in the interview process with other companies? Alyssa shares her advice for how to answer an interviewer when they ask where you are in the interview process with other companies. Alyssa shares her tips and tricks for Seniors who still need jobs. 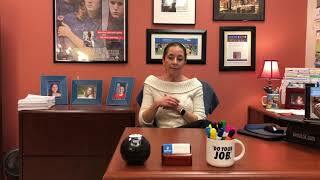 Alyssa explains what CDI201 and CDI301 are and why students should enroll.